Kakteen Südamerika 3: 1104 (1980). Altitude: 600 to1000 metres above sea level. Habitat: It grows in a very dry area near the cost in the border of desert. Plants in nature are often covered dust. There were several lilies and other wild flowers that cheered up the otherwise grey hill side. At times this region is dominated by geophytes (like lilies and other wild flowers), which can cover expanses of the desert spectacularly cheering up the otherwise grey hill sides. 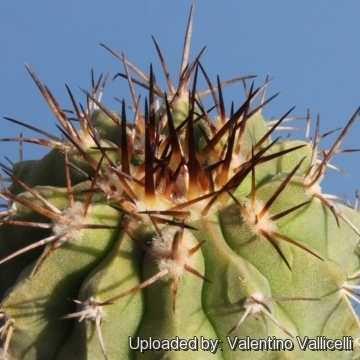 Description: Copiapoa eremophila is one of the controversial geographical forms of the very variable Copiapoa haseltoniana similar (if not the same) as Copiapoa gigantea. It is a densely spined form with very distinctive yellow-brown spines, later almost black found only on the high altitude range of the species. 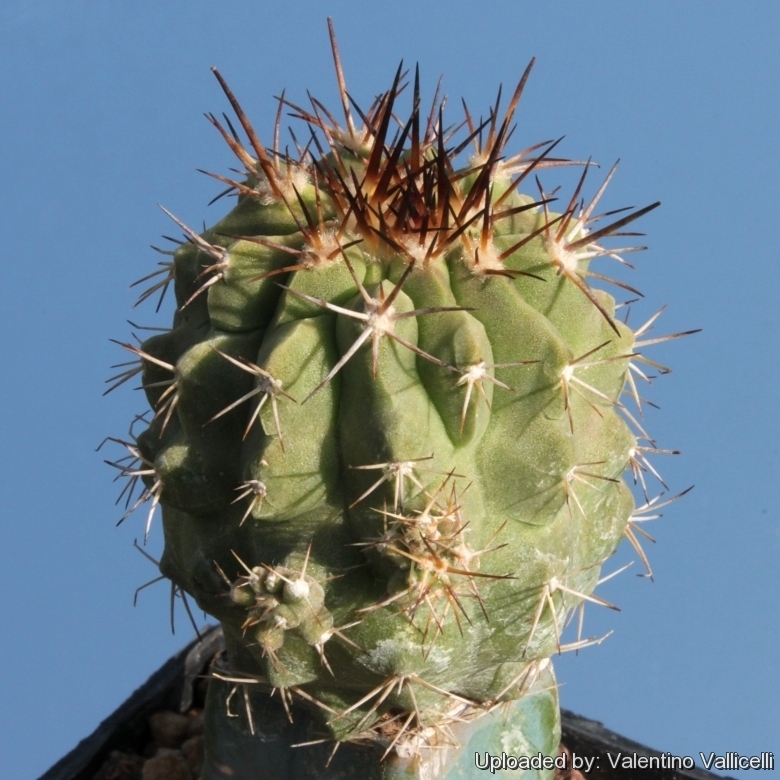 However apart for the spines it look very similar to other varieties of Copiapoa haseltoniana which are linked one to each others by populations of plants with intermediate characteristics. Nowadays all them are thought to belong to a unique polymorphic species. Such variations has led to establishment of several unnecessary names for this species. Habit: It is a large sized often elongated and columnar plant slowly branching from the base, forming large, open clumps with (usually) few individual stems. Stem: Globose to cylindrical, up to 1 m high, 20-30 cm across, pale olive-green, grey-green or ash-grey to silvery-blue when old, the apex is very spiny, covered with reddish, orangish or yellowish-brown wool. The whitish-grey coloration is a waxy coating presumably to prevent desiccation in it's extremely dry environment. In cultivation the white waxy bloom is often not produced, revealing a brownish epidermis. Radial spines: Up to 7, about 1-2 (or more) cm long, hard, horny-yellow to brown coloured, later brown-black, terete, tipped darker, spreading, straight or slightly curved. Central spine: 0-1(-2) similar in colouration. 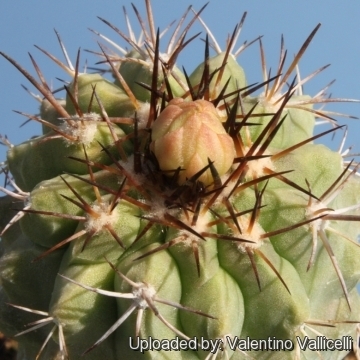 Cultivation and Propagation: Considering that Copiapoa eremophila comes from a habitat with an extremely arid climate, they are remarkably tolerant of pot culture, but susceptible to overwatering. They requires also an appropriate air circulation. Copiapoas are summer grower species easy to cultivate. Hardiness: Not highly tolerant of a great deal of frost.They need to be kept in a cool place during winter rest and are resistant to light frost if kept on the dry side prior to, and during, cold weather ( they are hardy to -2 C ° C short periods). However some warmth throughout the year will increase the grower's success (minimum 5° to 10°C during rest season).